Grand Theft Auto: Vice City (also referred to as GTA Vice City, Vice City and GTA VC), is the sixth game in the Grand Theft Auto series and the second game in both the GTA III Era and 3D Universe. The game was directed by Navid Khonsari, designed and developed by Rockstar North and published by Rockstar Games. The game was initially released on October 27, 2002 in the United States and Canada. By the end of 2002, the game had also been released in Europe and Oceania with a PC and Xbox release coming in 2003 and 2004. The game is also now available on iOS devices, Android devices and the PlayStation Network. GTA Vice City was also released as part of Grand Theft Auto: Double Pack for the Xbox, along with Grand Theft Auto III through Rockstar Vienna. 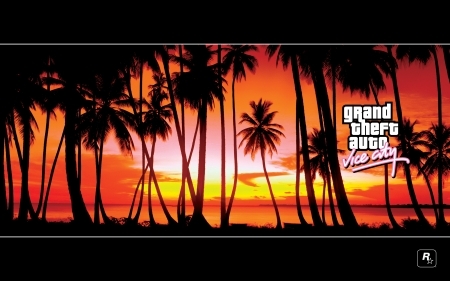 The game revolves around the exploits of protagonist Tommy Vercetti after his arrival in Vice City in 1986. The game is set two years after the events of Grand Theft Auto: Vice City Stories, six years before Grand Theft Auto: San Andreas, twelve years before Grand Theft Auto: Liberty City Stories, fourteen years before Grand Theft Auto Advance and fifteen years before GTA III. It uses a tweaked version of the Renderware game engine used by GTA III, and similarly presents a huge cityscape, fully populated with buildings (from hotels to skyscrapers), vehicles (cars, motorcycles, boats, helicopters, and planes) and people. It also introduces over-the-top-gameplay that was later included in the games Grand Theft Auto: San Andreas, The Ballad of Gay Tony, and Grand Theft Auto: Chinatown Wars. NataliyaRodin Uploaded by NataliyaRodin on Nov 28, 2016 . Grand Theft Auto: Vice City - Desktop Nexus Video Games Download free wallpapers and background images: Grand Theft Auto: Vice City. Desktop Nexus Video Games background ID 2196932. Grand Theft Auto: Vice City (also referred to as GTA Vice City, Vice City and GTA VC), is the sixth game in the Grand Theft Auto series and the second game in both the GTA III Era and 3D Universe. 1 thing I can say is I wish it was available for the ps3 and it came in the CD form and not on the PSN. anyone agree with me?